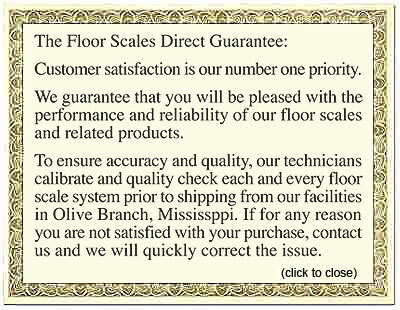 Shop 5x5 industrial floor scales from a superior manufacturer that provides top customer service. The 5000 lb floor scale packages from Floor Scales Direct arrive ready to hook up, factory calibrated and rated for hostile outdoor environments. 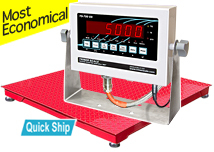 A division of the Triner Scale & Manufacturing Company, Floor Scales Direct manufactures floor scales for sale for warehouse shipping and receiving, and industrial weighing applications. 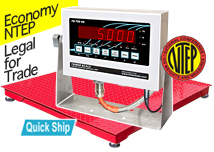 Each 5000 lb floor scale package includes the appropriate weighing decks, digital indicator, and cables for connection. 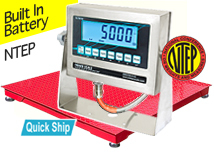 As the manufacturer of these industrial floor scales, we’re proud to be able offer free shipping on our floor scales for sale within the USA. Our courteous customer service staff is available for any ordering help by email or toll free at (800) 238-0152. Upon shipment, every order receives a tracking code to anticipate the timely arrival of your shipments. 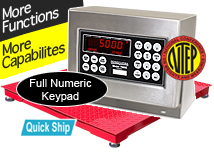 Choose Floor Scales Direct for all of your container, pallet and industrial weighing needs.